A large part of the legal debate about European social integration has been focussed on social dialogue, and in particular on the role of European collective agreements, as formerly regulated by the Maastricht Agreement on Social Policy, but now incorporated into the Amsterdam Treaty. 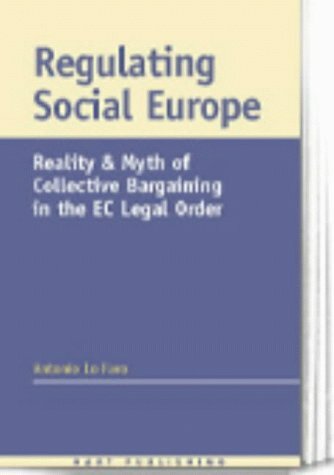 In this volume, an attempt is made to conceptualise the function of European collective bargaining, based on an analysis of the Treaty provisions specifically dealing collective bargaining, but going beyond the Treaty in several respects. Taking an inter-disciplinary approach, the book seeks to broaden the analysis of European collective bargaining, placing it within the broader institutional context of the phenomenon usually referred to as "EC regulatory deficit". Against this background the author gives proper recognition to the different factors - legal, theoretical, institutional, political and industrial-relations oriented - which converge in the field of European collective bargaining. The author concludes that in the overall context of a general redefinition of Community regulatory strategies, European collective bargaining should be viewed not as evidence of an incomplete supranational legal pluralism but rather as a construction of Community law. A large part of the legal debate about social integration has been focused on social dialogue, and in particular on the role of European collective arguments, as formerly regulated by the Maastricht Agreement on Social Policy, but now incorporated into the Amsterdam Treaty. This volume attempts to conceptualize the function of European collective bargaining, based around an analysis of the Treaty provisions specifically dealing with collective bargaining, but going beyond the Treaty in several respects. Taking an interdisciplinary approach, the book seeks to broaden the analysis of European collective bargaining, placing it within the broader institutional context of the phenomenon usually referred to as "EC regulatory deficit". Against this background the author recognizes the different factors - legal, theoretical, institutional, political and industrial-relations oriented - which converge in the field of European collective bargaining. The book concludes that in the overall context of a general redefinition of Community regulatory strategies, European collective bargaining should be viewed not as evidence of an incomplete supranational legal pluralism, but rather as a construction of Community law.